In a recent study, NAHB used newly released American Community Survey data from the U.S. Census Bureau to show that, in the U.S. as a whole, there are a little over 48 million households headed by someone age 55 or older, accounting for roughly 42 percent of all U.S. households. Although the percentage is different in different states, the variation is relatively modest. 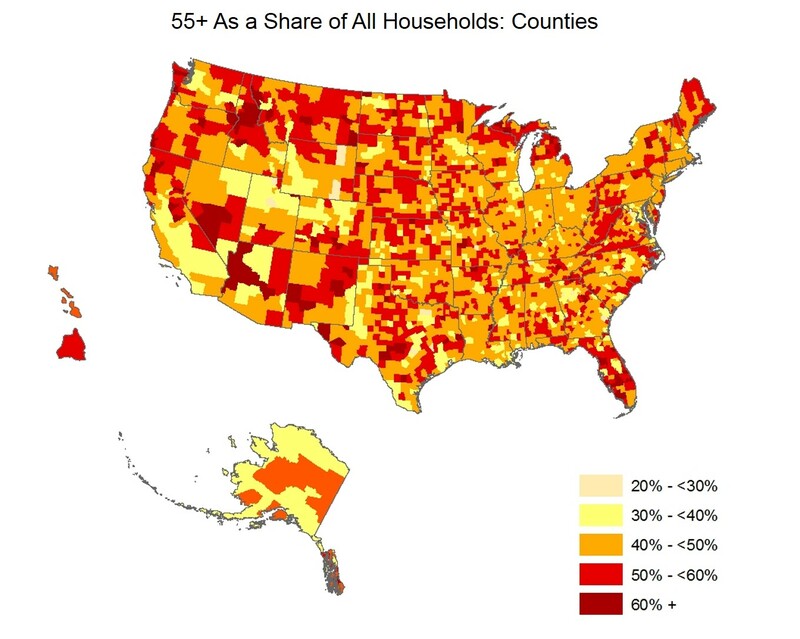 Of the 51 states (including the District of Columbia), 35 are clustered in in a very narrow band with a 55+ share of all households between 40 and 45 percent. In no state do 55+ households account for less than 34 percent, or more than 49 percent, of all households. At the low extreme, 55+ accounts for 34.3 percent of all households in the District of Columbia. At the high end, 55+ accounts for 48.3 percent of all households in West Virginia. Compared to states, counties are considerably smaller and more variable. Even so, in every one of the 3,142 counties (including county equivalents like the parishes in Louisiana, independent cities in Virginia and Census designated Areas in Alaska) 55+ accounts for over 20 percent of all households. In fact, for 3,114 of the 3,142 (more than 99 percent of them), 55+ accounts for more than 30 percent of all households. If anyone wants to look up statistics for a particular state or county, you can find them in the complete, original study. The tables in that study show the total number of 55+ households, broken down into home owners and renters, as well as the share of all households in the area that are 55+. The state table also shows where each state ranks in terms of its 55+ household share, high to low, from 1 through 51. The county table shows where each county ranks, both within the state, and within the country as whole.